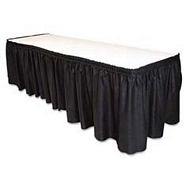 Keep any spills or messes from being seen at your party with this Black Plastic Table Skirt. The opaque dark color will hide anything you don't want seen and the plastic material makes it easier to clean up or throw away at the end of the event. This cloth would also be perfect for a Black and White party filled with elegance and style. This cover fits rectangular tables sized 14' x 29. Many products we offer come in assorted designs, styles or colors. Please indicate style/color preference, if any, in the Order Notes of our checkout process. We will attempt to meet any request. 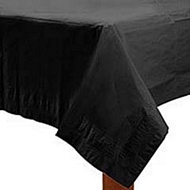 Jet Black Paper Tablecover 54" x 108"
Jet Black Plastic Round Tablecover 84"